“They warn of how doctors in Singapore are obliged to report suspected drug use to the authorities, and highlight the strict anti-drug laws and stiff penalties here” (More Singapore Residents Going Overseas To Kick The Drug Habit, Kok Xing Hui). Despite assurances by members of parliament they drug abusers who seek treatment in the country will not be convicted, it would be more convincing if more data is provided on the number of reports made over the years, and how these numbers compare to arrests of drug abusers. 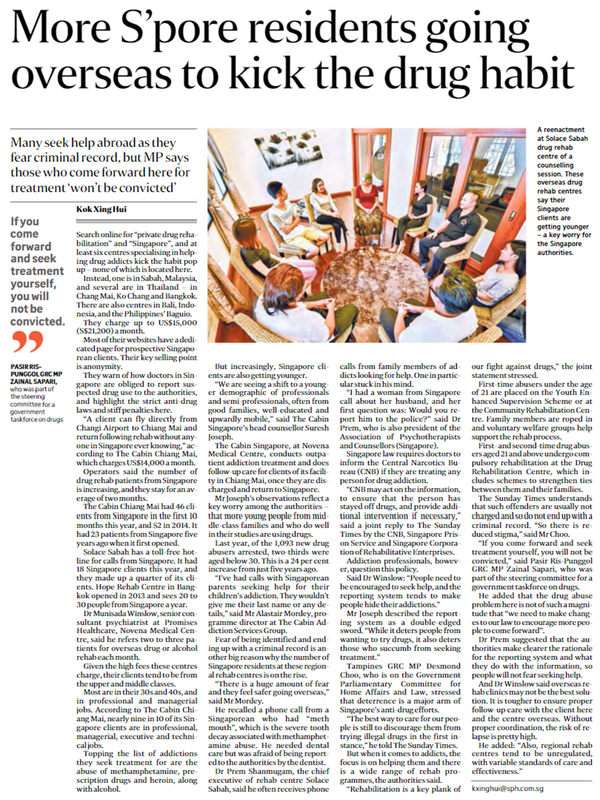 Two problems are apparent, as more Singapore residents go overseas to private drug rehabilitation centres in the region, which promise anonymity, warn of the strict anti-drug legislation in Singapore, and even have “dedicated [web-pages] for prospective Singaporean clients” (ST, Nov. 29). First, addicts – for fear of reprisals in Singapore – may delay their treatment, and even if they get it from these aforementioned centres the possibility of relapse persists if the rehabilitation is not done properly. Second, law enforcement or social workers who work with these addicts may not get useful information about these individuals: their profiles and backgrounds, reasons for their addiction, or other related problems. Such information can be used when preventative strategies are designed, contributing to academic research in the process. Furthermore, by identifying those who are likely to suffer from addictions, treatments can be customised for the addicts. In this vein, I agree with the recommendation by Dr. Prem Shanmugam from rehabilitation centre Solace Sabah, that the authorities in Singapore should “make clearer the rationale for the reporting system and what they do with the information, so people will not fear seeking help”. At the moment, doctors are obliged by the law to notify the Central Narcotics Bureau when treating persons with drug addictions, and this may deter some from coming forward. Despite assurances by members of parliament they drug abusers who seek treatment in the country will not be convicted, it would be more convincing if more data is provided on the number of reports made over the years, and how these numbers compare to arrests of drug abusers. In addition, they can share more about the outcomes of the reporting system, and how individuals seeking help are filtered into different channels. It is one thing to assert that first- and second-time abusers “are usually not charged and so do not end up with a criminal record”, but another to show the numbers, and dispel the fears as a consequence.